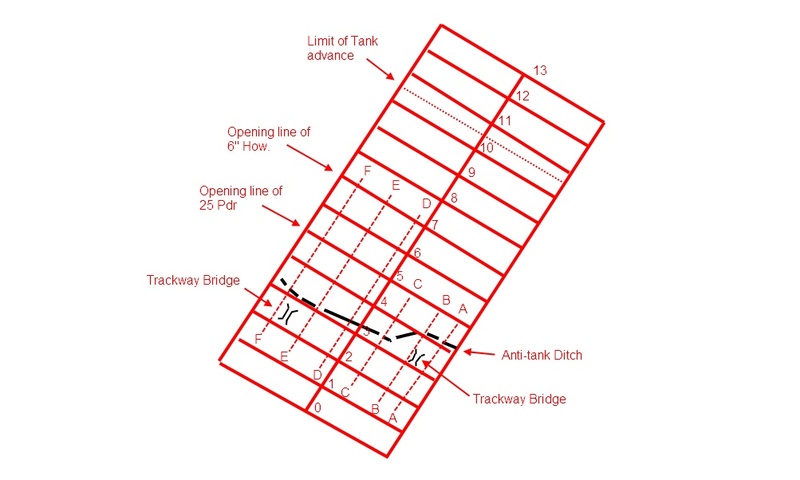 The above image shows the barrage trace for the exercise. The fire plan was for 25 pdrs and 6” Howitzers to open fire at zero on the opening line for 2 minutes. Is was then to lift at 200 yards per minute. A 'trace' would be issued to the various artillery units taking part and would have simply been placed over a map. The above shows an example of a trace with two 'lanes' for batteries. Smoke cover was to be provided by 3” mortars. 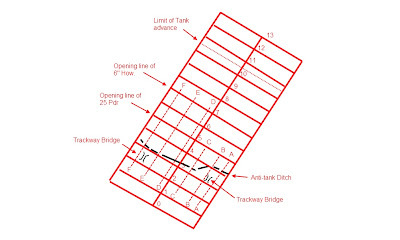 · The Echelon method – in each lane the lifts are equal so the pace of advance of troops/tanks is also equal. The disadvantage of this method is that infantry/tanks are not brought onto the objective at the same time. The barrage in the exercise is an echelon barrage with two lanes. · Royal Engineer parties to move forward and cut and mark six lanes through the first belt of wire 12 feet wide. 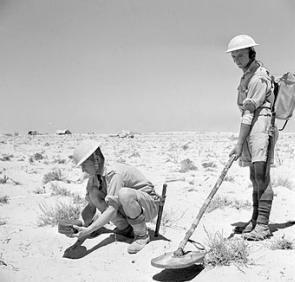 · Lanes to be cleared and marked through first minefield by prodding (three lanes, each lane18 feet wide) and use of polish mine detector (three lanes, each lane 18 feet wide). This was to be completed in 35 minutes – and following this was to be the crossing of the anti-tank ditch and second minefield. This will be the subject of the next and final post of this exercise. Above: Polish mine detector (in use in by 8th Army -IWM). Development of this detector was started in Poland pre War but was interrupted by the outbreak of War. A final design was completed by Jozef Kosacki in late 1941 and 'gifted' to the British Army (Source: Wickipedia). Very interesting. I have been visiting this part of Suffolk for a couple of years and on walks am always intrigued by signs of past military use of the land. I found your blog when searching to find out about the churchill tank incorporated into the Sudbourne village sign, and learning about the battle training area. Thanks for explaining the concrete structures on Boyton marshes. Forgive me if I've missed it as I've browsed, but do you know what the several hundred metres of concrete remains south of the Bentwaters perimeter were? (West of the campsite off Sandlings Walk.) They told me in BCWM that it was nothing to do with the airfield and I assume it was related to the camps in The Thicks and The Clumps. The short answer is no! But many thanks for the info - now on this coming winter's plan of exploration.